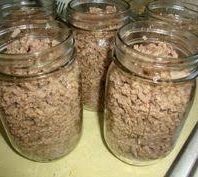 Pressure canning meats is a great way to have the makings for soups, casseroles, tacos, etc. on hand for quick meals! Learn how to prepare strips, cubes or chunks or meat – bear, beef, lamb, pork, veal, venison…all can easily be preserved using this method.